Are you always on the road? 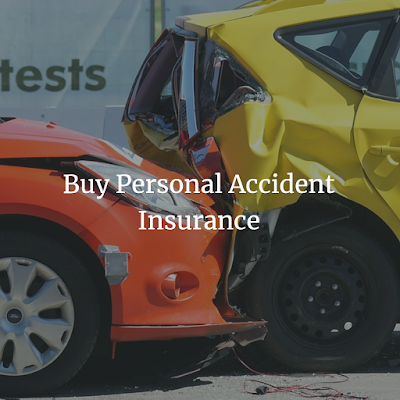 It is time to buy personal accident insurance - Finance Dunia Home Loan | Car Loan | Education Loan | Life Insurance | Car Insurance Etc. At 26, Rajiv was the most prudent person I had ever met. He had a fantastic career graph, with a wonderful wife and two kids on the personal front. Like any other family man, he bought a term insurance to secure his family in his absence. After the birth of his second child, he also bought a comprehensive family floater health insurance. Armed with both these policies, he was confident that his family would always remain safe and secure in case of an emergency. However, life is unpredictable and takes uneven turns when you least expect. One day while going to the office, his motorcycle collided with a car coming from the other side. The accident left him incapacitated for the next six months. While his health insurance policy took care of hospitalization expenses, he had to dig into his savings to meet household expenses. As he was alive, his term insurance also did not help him. Suddenly, reality struck him hard and made him think, is there anything he could have done to avoid the current situation? There are many people like Rajiv for whom coverage means taking health and term insurance policies only. While you may bank on your term insurance in case of death and health insurance in case of a medical emergency, you can depend on your personal accident policy in case of any disability. Why should you go for personal accident insurance? Indian roads, which record the highest road fatalities in the world, claimed more lives in 2015, with the number of road deaths increased to 1.46 lakh. As per some government data, 400 people are killed every day in road accidents. Accidents come unannounced, and they affect not only physically, but financially also. In case the breadwinner is involved in the accident, the family’s income may also get affected if he/she is forced to take a break from the work. The situation becomes worse if the policyholder dies in an accident. While injuries can make you disabled temporarily or permanently, they can drain your life’s savings, leaving your family in a tough situation. Hence, for securing your family’s well-being and meeting its day-to-day needs in your absence, it is must to buy a personal accident policy. While it is difficult to avert accidents, one can buy a personal accident policy to deal with the financial burden of an accident. The policy offers compensation in the event of injuries caused due to accidents. Accidental death: In the case of death of the policyholder during the policy tenure, the nominee gets the sum insured as mentioned in the policy document. Permanent total disablement: If due to an accident, the policyholder has a permanent or total loss of limbs, sights or any other disability, he/she will be paid the sum insured. Reimbursement of accidental hospitalization expenses: In the case of a minimum of 24 hours hospitalization following an injury, the policyholder can approach the insurer to compensate for the hospitalization expenses. Accidental hospital daily allowance: Some insurers give a per day allowance for each day of hospitalization to cover expenses like food, transport, etc. Cover expenses, like home treatment, physiotherapy, etc. Is it affordable to buy a personal accident policy? Yes, personal accident insurance policies are one of the most affordable insurance coverage available in the market. By paying a small premium amount, you can get comprehensive coverage. Further, unlike other policies, the age of the policyholder doesn’t decide the premium, as it mainly depends on the occupation of the person. It means a young army officer will have to pay high premium rates than a 50-year old teacher. In the case of disablement, the insurer would ask for a doctor’s report to find out the extent of disablement. What to choose a rider or a standalone policy? Accident cover can be bought both as a rider and a standalone policy. However, most riders offer limited coverage as they cover only the accidental death and permanent disability. On the other hand, a standalone policy offers comprehensive coverage as it includes various types of losses, including partial or temporary disablement and income loss. Further, these policies are comprehensive and can easily be customized by the policyholder. Some employers also offer group personal accident cover. Usually, the personal accident policy should be at least 5-10 times of your monthly income, but the coverage offered by the corporate policy may not be sufficient. Also, a group plan only covers employees, but individual accident policy coverage can be extended to family members at an affordable premium rate. It is advised to buy the policy when you are young because the chances of an accident are quite high at that stage of life. Moreover, the unhealthy lifestyle doubles the risk of an accident. Thus, it is good to buy a policy when you are young. An aspect to consider is that how Accident is defined in personal accident plans. Accident must be caused by sudden, external and violent force. Must give a lot of leeway to insurance companies. Think customers should be aware of this. But yes, totally agree that an accidental disability cover is indispensable. Nice informative article. ICICI Bank is really great support in all banking service as well as insurance policy.